Seaport regularly offers informational seminars for our team members on a variety of topics – everything from how to save for retirement, eating for better health and planning for your children’s education. 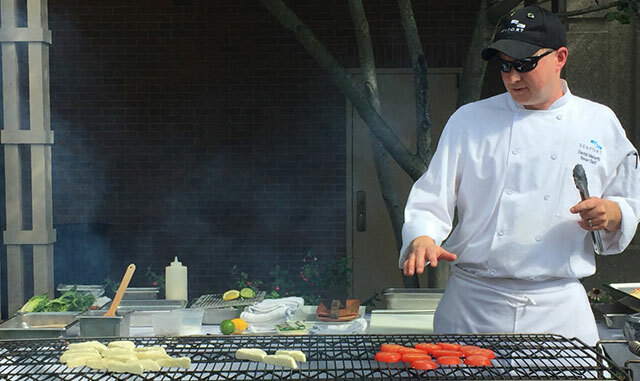 This summer, Seaport’s FUN Seminars debuted and most recently, Chef David led a Summer Grilling Techniques course. Attendees gathered in Seaport’s plaza garden and learned a handful of tips (such as, due to the sugars in sauces, always add them during the last few minutes of cooking to avoid burning; the best fish for grilling is a firm fish such as halibut, salmon, swordfish or tuna). Team members also sampled a variety of grilled specialties, including the recipe below. Enjoy! Drizzle the tomato slices with olive oil salt and pepper. Cut the Halloumi in half (the long way) and season with olive oil and pepper (Halloumi is salty so it doesn’t need the salt). Place the tomatoes and Halloumi over direct heat on the grill for about 3 minutes each side. Cut the Halloumi into triangles. Shingle stack a tomato slice, a slice of Halloumi, slice of tomato, and slice of Halloumi. Squeeze fresh lemon juice on top with hand torn basil and serve immediately.